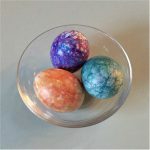 These Nail Polish Stained Glass Eggs can be made from the wide variety of nail polish colors that are available today. Use up your old thick polish or buy the cheap stuff from the dollar store. Each one is more beautiful than the rest. These eggs are for decoration only as the polish will seep through the shell and should not be eaten. This craft might be popular with the teen and preteen set. 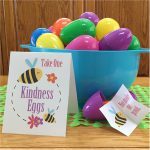 There are several other Easter Egg decorating ideas to be found in the Easter crafts category. Fill bowl half full with water. Drop one drop of nail polish into the bowl. It will disperse over the top of the water. Dip egg in. Let dry. It will dry quickly. Drop another color of polish into the water. Dip egg in. Repeat until you have the desired look. Change water frequently for best results. Note: These eggs are for decoration only. Do not eat them as the chemicals in the polish seep through the shell.